Tour the University of Mississippi’s campus. Arguably one of the most beautiful campuses, with its rich history, charm and architecture, it is almost like stepping back in time. Why not take a tour of it during your visit! You can either walk the campus or take an hour-long Rebel Rickshaw/petty cab tour. Rebel Rickshaw is also available for a historic downtown tour of Oxford, Mississippi. Call Visit Oxford at 662-232-2477 to book your tour. Tour William Faulkner’s beautiful Rowan Oak home. 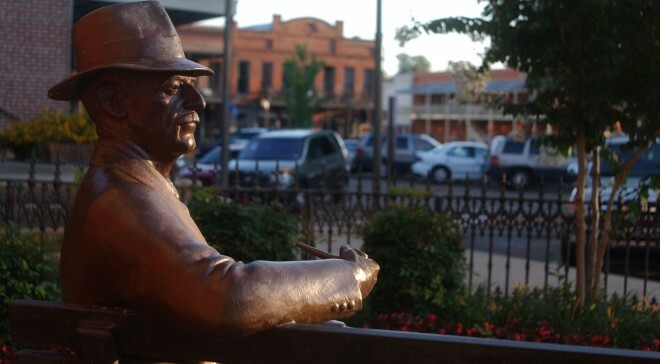 Travel back in time to an era of history of one of the greatest authors, William Faulkner, who called Oxford his home. Visit The Grove on the university’s campus – a legendary tailgating area located at the center of the University of Mississippi. Whether it’s for a football game tailgate, having an afternoon picnic, or just taking in the beautiful scenery around, The Grove is a great spot to hang out while you’re visiting Oxford. Explore Downtown. Located in the heart of Oxford is the Historic Downtown Oxford Square, locally known as “The Square.” With a variety of restaurants, museums, art galleries, clothing, boutiques, specialty shops, and more, The Square offers tourists and locals alike a place to congregate, people-watch, shop, and experience Oxford. Take some photos in front of City Hall where you’ll find an old London Telephone Booth, and William Faulkner’s statue! Come to Oxford for an athletics game. Visit http://www.olemisssports.com/ for full schedules. Enough said! Visit Square Books in Downtown. This is a bookstore with a large array of William Faulkner novels and world renowned Mississippi authors. Picture floor to ceiling bookshelves housed in an old three story building with a coffee shop on the third floor with areas to relax and read. Visit the Confederate Soldier Cemetery – a cemetery well worth the stop – a hauntingly beautiful place with a historic past. “Established during the Civil War, the Confederate Cemetery was used for both Union and Confederate soldiers who died in the hospital at the Battle of Shiloh. Shortly after the war, the Union dead were removed and reinterred in the Corinth National Cemetery. Archaeological investigations have identified more than 430 grave shafts in this cemetery” (http://preview.visitoxfordms.com/attractions/confederate-cemetery/). Check out the Gertrude C. Ford Center for the Performing Arts for events going on! “The Ford Center” is known for their 150 annual events, including National Broadway Tours, VIP guests, and their first event, the 2008 presidential debate! Tour the University of Mississippi Museum. Guided tours are available upon request and group tours are welcome with advance notice. Located on the main campus of the University of Mississippi, the museum comprises the Mary Buie Museum (1939), the adjoining Kate Skipwith Teaching Museum (1977), the Seymour Lawrence Gallery of American Art (1998), and the Lib Fortune Gallery (1998). Southside Gallery on the square is home to regional, national and International art. Most openings have the artist(s) present, which gives visitors the opportunity to meet and interact with the artist. Exhibits have included painting, sculpture, photography and folk art. The art is displayed on two floors, with the upper story exhibiting art from previous shows, with one room concentrating on folk art. Gallery space can be rented for special events, such as wedding receptions and other celebrations. Check out the Mid-Town Farmers’ Market. One of two farmers’ markets in Oxford, the Mid-Town Farmers’ Market is run by volunteers and has been in operation for several years. Local vegetables, fruit, eggs from free-range chickens, and meats from locally grown pork free of additives such as growth hormones. Coffee sold for shoppers’ convenience! Live plants are sold in the spring, such as basil, and a local musician usually provides soothing entertainment while you shop. The Farmer’s Market is open on Saturday mornings from 7am – 11am May to October and additionally on Wednesdays starting in June of each year. The Powerhouse Community Arts Center, home of the Yoknapatawhpa Arts Council, serves as a venue for theater and art classes, performances, and community events. Walk, play, or relax at Pat Lamar Park. This park hosts a beautiful walking trail and a fishing lake for kids under 16, and outdoor sculptures by local and national artists. Lamar Park is a nice place to stay cool during the long, hot summer with picnic tables in a shaded portion of the park, perfect for a summer picnic, as well as benches for sitting. Check out The Lyric Oxford for events and concerts going on right on the Oxford Square. Check their website, http://www.thelyricoxford.com/, for the event schedule. We appreciate Meggie Morgan for her contribution of this blog post.